One hundred and nineteen owner-occupied and rented houses are sited amidst a network of car-free unpaved paths; parking is confined to the outskirts of the neighbourhood. The layout follows the terraced house format. Here the rows are chopped up into blocks of one to eight units and shifted out of alignment. Glazed garden sheds and sundry small clearings complete this vibrant pattern. The blocks are spartan in their simplicity. 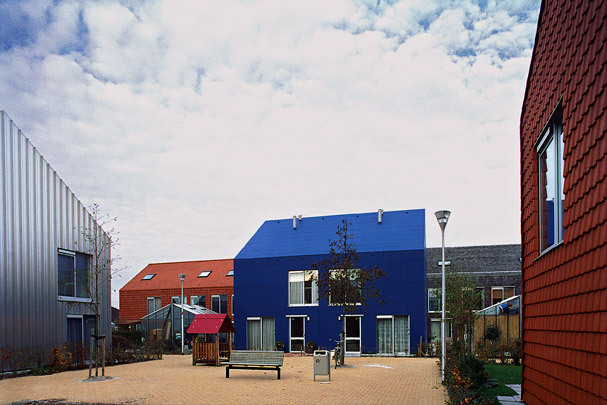 Variation is achieved by alternating the materials and colours of both roofs and fronts: with wood shingles, aluminium sheeting, roofing tiles and polyurethane panels in vivid green and blue, silver and black, brown and orange.